Medical field is upgrading constantly. This is the reason medical professionals have to deliver presentations on various subjects and research topics. These presentations are useful at all levels including academic areas, pharmacy research, hospital administrations, etc. However, the problem lies with design, contents, timings, etc. If you are a medical professional and running out of time, you should develop presentations with PowerPoint. 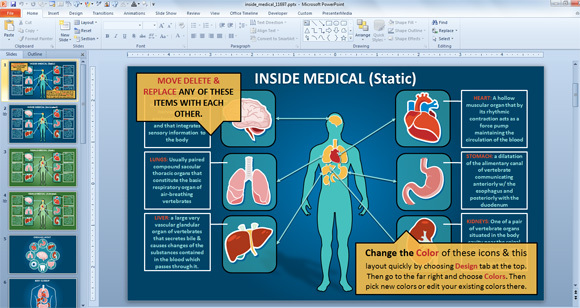 Why Medical PowerPoint Presentations are used? Medical science is a wide field where lots of research and practice take place. Therefore, many medical professionals take part in conferences and seminars for presenting their research papers, study materials and other related topics. However, many medical professionals face challenges while preparing slides. Medical professionals devote most of the time in research works. They are hardly left with time to articulate on given topics. While preparing the slides, they get confused on how to present their points in sequence. However, you should try your level best to deliver the best presentation. What is the reason for delivering a presentation? Many people cannot decide the aim of presentation. For example, you have been asked by your boss to prepare presentation slides as the company has come up with a new generic drug. For that, both you and your boss have spent time for discussing the contents. Just ask yourself, if you are going to present the contents containing formulae and reactions, will you be able to reach the right audience. If your presentation is meant for patients, then you should speak about the benefits. This way you can spread awareness about your newly launched drug. If your aim is to target doctors, then you should describe how the medicine works on the body. This way doctors would learn how fast the medicine offers relief to patients. The medical sector is a vast arena. Lots of topics are to be explored. First, decide the topic to be discussed. This would also help you to attract the right audience. When time becomes the limiting factor, many medical professionals do not find ways to schedule the slides in a sequence. Maintaining sequence is important for visualizing the topic in the right manner. For example, suppose you have decided to present a paper on urology. You are researching on new methods of treatment. When you are presenting the paper, you should give a short introduction of the topic. Then, you should throw light on a number of people getting affected with that disease. After you have described the demography, then you should describe your findings on new treatment methods. Then you should summarize the entire presentation. The aim of the presentation should be to offer valuable information to your audience. However, slides work as supporting tools for delivering the presentation. You can find lots of PowerPoint templates on the internet. These templates are available free of cost. However, choosing a design blindly does not create the desired impression. The design of your slides should match with the topic. For that reason, you should hire a professional service like Power Slides, which can develop interactive medical templates as per the topic of discussion. This kind of professional would also work on font issue and suggest you with the best fonts that are readable easily. These are the best ways of making the best medical PowerPoint presentation. A PowerPoint presentation helps you to present your ideas, research works and other topics in a professional manner. When you become successful in sufficing the queries of your audience, you can definitely achieve the benchmark. Dan Brown is a graphics design professional working with Power Slides. He suggests best ways of developing PowerPoint presentations to medical students, doctors, and other medical professionals.